John Dingell's Health Care Legacy Is Broad And Deep : Shots - Health News During the 1980s and early 1990s, Rep. John Dingell was instrumental in expanding the Medicaid program, reshaping Medicare and modernizing the Food and Drug Administration. He died Thursday night. 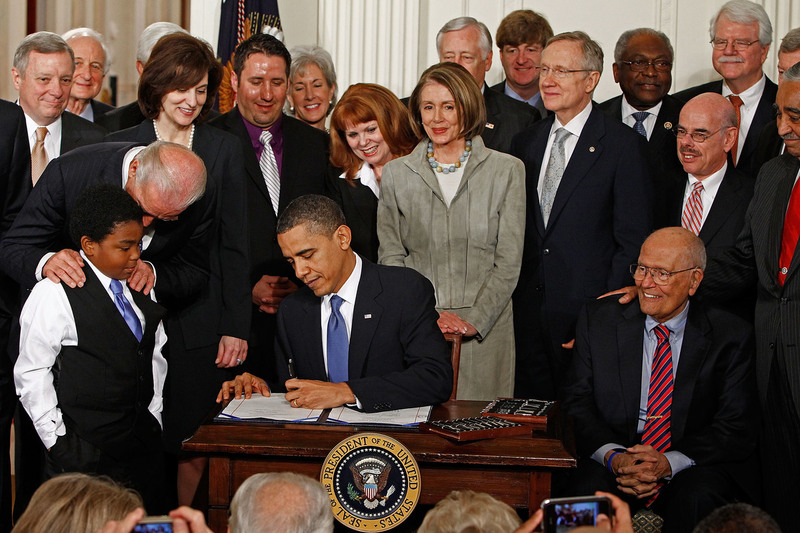 Rep. John Dingell was seated next to President Barack Obama when he signed the Affordable Care Act into law at the White House on March 23, 2010. Dingell served in the House for nearly 60 years. As a young legislator, he presided over the House during the vote to approve Medicare in 1965. Dingell was "a beloved pillar of the Congress and one of the greatest legislators in American history," said a statement from House Speaker Nancy Pelosi. "Yet, among the vast array of historic legislative achievements, few hold greater meaning than his tireless commitment to the health of the American people." He was not always nice. Dingell had a quick temper and a ferocious demeanor when he was displeased, which was often. Witnesses who testified before him could feel his wrath, as could Republican opponents and even other committee Democrats. And he was fiercely protective of his committee's territory. In 1993, during the effort by President Bill Clinton to pass major health reform, as the heads of the three main committees that oversee health issues argued over which would lead the effort, Dingell famously proclaimed of his panel, "We have health." Dingell and his health subcommittee chairman, California Democrat Henry Waxman, fought endlessly over energy and environmental issues. Waxman, who represented an area that included western Los Angeles, was one of the House's most active environmentalists. Dingell represented the powerful auto industry in southeastern Michigan and opposed many efforts to require safety equipment and fuel and emission standards. "It was always a relief for me to know that when he and I met with the Senate in conference, we were talking from the same page, believed in the same things, and we were going to fight together," Waxman said in 2009.